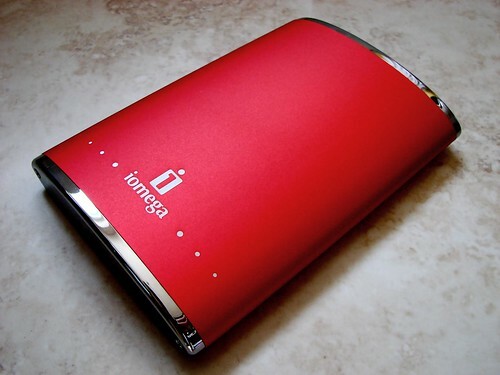 Portable hard drives are an ideal way to give notebooks that extra boost in capacity. With cheap and fast drives now available in capacities up to 250GB, what better way to offload some of your media than an external drive. My MacBook Pro is coming up to its two year anniversary and its measly 80GB drive has been eclipsed by new storage capacities available today. 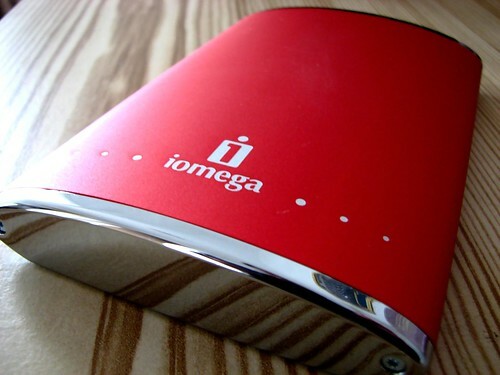 Iomega has been pushing out some unique and interesting designs with their hard drive range, my first experience was with the UltraMax RAID system and now with the eGo. It’s possible that the hard drive industry is going all chic, contemporary and designer – its shouldn’t be long before we see a Swarovsky diamond-encrusted drive. I can’t help but but notice that the design of the eGo is very similar to a drinks flask. The type you keep in your inside trenchcoat jacket and you take a sip from on a cold winter night. I can’t get confirmation of where the inspiration came from but I think it works. Finished with an aluminium exterior the ‘iomega red’ is finished with chrome ends. The base is flat and will sit nicely on your desk forcing it in to the correct position so your drive is never put under undue stress from pesky gravity. You’ll find the eGo to be both light and compact, but you might want to treat it with respect because the chassis isn’t built for ruggedness. Given enough knocks or perhaps canoodling with a set of keys in your pocket, will ultimately result in an unhappy ending. The eGo is available in 160GB and 250GB capacities all running at 5400RPM and 8MB of cache. Connectivity on the 250GB review unit came in the form of USB but for a bit more you can also get Firewire. DropGuard, an impact-protection technology is designed to cushion the insides from shock and vibration in drops up to 1.3 metres. The eGo is available in a range of colours including pink, silver, white, black, red and blue however the 250GB model is only available in the signature red for the USB range. For the USB/Firewire range you can get the 250GB in red or black and the 160GB in red or white. 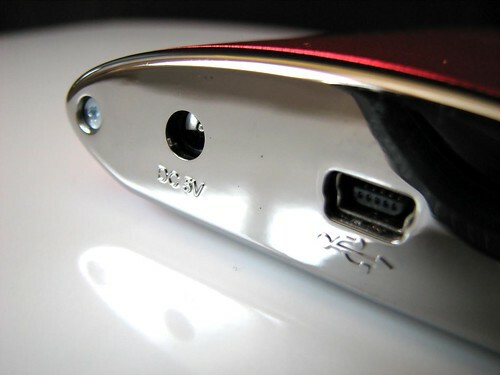 I welcome the day when hard drive manufacturers start putting USB and Firewire ports on all of their drives. For the test, I pitched the eGo using USB 2.0 against the big daddy UltraMax 640GB raid drive using a Firewire 400 connection. The eGo held its own with a very surprising result when comparing it to the UltraMax drive. Given that these scores are tested with my MacBook Pro drive spinning at 5400RPM and has 2MB of cache, it’s possible that both the eGo and UltraMax pushed the hard drive bandwidth in my notebook to the limit, explaining the same times for the 1.07GB file transfer. 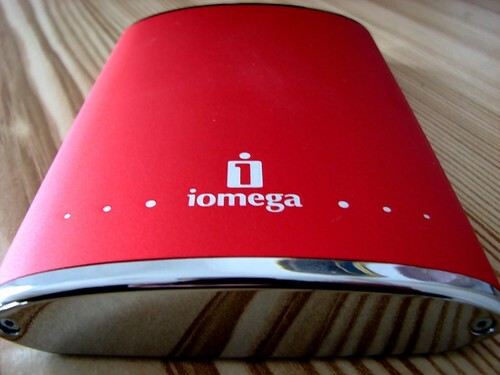 Iomega have done well to get this stylish drive down to a competitive price and offering USB and Firewire connectivity is also a bonus – however it would have been nice to have this as standard to really separate it from its competitors. In all its modern magnificence, the eGo is unlike anything else out there today. Combining an understated look that manages to be impressive, opulent but without too much fuss with a fast hard drive and impressive capacities. 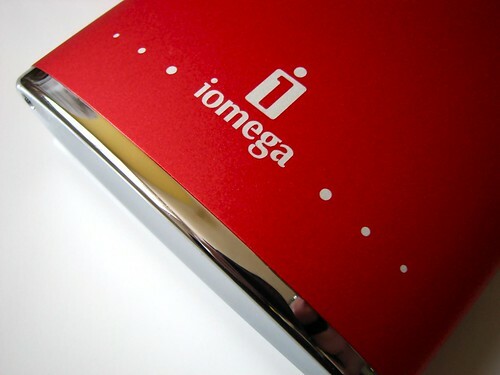 Has iomega done it again – given the technology world something to be proud of? I think so and when you buy it, so will you.